For thousands of African Americans growing up in the groovy 1970s, the velvety voice of “Soul Train’s” impeccably dressed host Don Cornelius signing off on his groundbreaking show, with a wish of “Love, peace, and soul” left a deep and lasting imprint. “Soul Train” didn’t break ground, it shattered it and the force behind the sonic boom was an ambitious man with a plan, Don Cornelius, who owned the intellectual property. 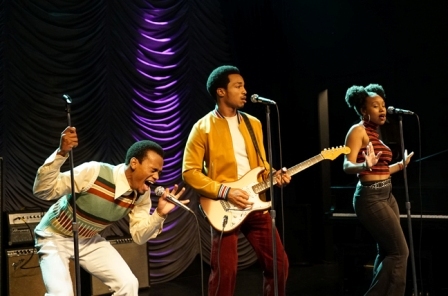 In the new ten-episode series, “American Soul” debuts on BET with back-to-back episodes starting on February 5, 2019 (at 9 pm ET/PT) the deep dive into what made “Soul Train” a formidable presence is creatively explored with a screenplay by Devon Greggory and Jonathan Price (Creators and co-showrunners) and executive produced by Jesse Collins and Tony Cornelius, son of the late Don Cornelius. Inspired by the untold rise of the iconic music and dance program, Soul Train, the series, American Soul, blends fictional and real-life characters and moments, chronicling the struggle to make the dream of Soul Train a ‘stone-cold’ reality. Set in the early 70s and filled with the music, dance and fashion, the story digs deep into the battles to launch one of the first nationally-syndicated Black music shows that was owned by Cornelius. And it was a battle. Battles with powerful record labels for top talent. Battles off-camera with the young dancers seeking payment for their work. Battles to keep his marriage from falling apart. 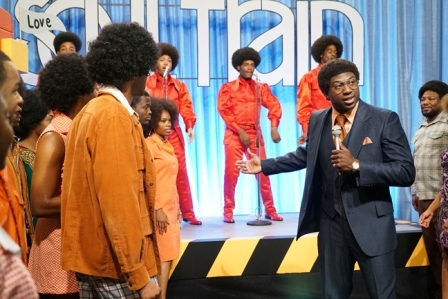 Battles to keep his Soul Train dream — alive. Under the careful eye of Robi Reed, head of casting for BET, the cast of unknown and up-and-coming talent is starting to cause critics and audiences alike to spread strong and positive word-of-mouth. Much like the actual dancers that appeared on the original “Soul Train,” the power is in the raw performances. 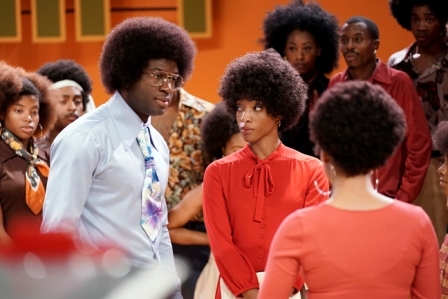 The full cast of BET’s “American Soul” includes Sinqua Walls, Kelly Price, Jason Dirden, Christopher Jefferson, Katlyn Nichol, Jelani Winston, producer Jesse Collins, and Tony Cornelius. Other guest stars will include a dynamic multi-episode performance by Kelly Rowland as Gladys Knight; singer and actress Michelle Williams as the legendary Diana Ross; consummate entertainer Bobby Brown plays the over-the-top Rufus Thomas; fresh off of her show-stopping role as Whitney Houston in “The Bobby Brown Story,” Gabrielle Dennis portrays Tina Turner; “Hit the Floor’s” McKinley Freeman plays Ike Turner; and singer and TV personality K. Michelle plays Martha Reeves. On the creative side, BabyFace serves as music director/supervisor and has added some original songs to the ten episode series. Fatima Robison is the choreographer. The first season directors include Peter O’ Fallon, Chris Robinson, Angela Barnes, and Robert Townsend. L.A. Watts Times (LAWT): In the role of Gerald Aims, a gangster and club owner who helps Don Cornelius understand how Hollywood works, you bring a very dangerous and intoxicating quality. Much different than your role as Basie Shanks in OWN’s Greenleaf. Jason Dirden (JD): (laughing) Thank you. LAWT: You have excellent body language. I suspect that comes from working in theater? JD: (laughing) Yes, my background is on the stage. When I moved to Los Angeles, I wanted to see what kind of trouble that I could get into. It took me about four years to get into that trouble (laughing) but I’m in it now. LAWT: Do you miss theater? JD: Yes and no. I don’t miss the [lack of] money, but I still work in theater. The last time was 2016. Theater keeps the [acting] muscle strong. Acting is the craft that you have to do it in different mediums to stay strong in all the mediums. LAWT: Do you have any personal memories of ‘Soul Train’? JD: Growing up, we always had music in the background. My father owns ten thousand records, easy. He has every genre that [the late] Ray Charles sang in, but ‘Soul Train’ was always on, the background, on Saturday mornings, for sure. LAWT: There were four directors for ‘American Soul.’ Tell me about your experience of working with the director, Robert Townsend. JD: (sigh) Robert Townsend man, he’s an actor’s director. He knows how to communicate with the actor and he really knows how to really tell stories. Not just the story of the episode, but the story of the scene. LAWT: I interviewed Robert [Townsend] and ‘The Five HeartBeats’ is coming to Broadway, did you know that? JD: (laughing) The manager didn’t sing, did he? L.A. Watts Times (LAWT): Katlyn Nichol, I can’t believe how well you sing. I can understand how at the age of 12 you were signed to Mary J. Blige’s Matriarch/Island Def Jam. Impressive and you play several instruments. You are a welcome surprise. Let me just say this, you devour the screen. Katlyn Nichol (KN): (blushing) Oh my gosh, thank you, yes ma’am. I receive it. LAWT: Tell me about this young, ambitious dancer, Simone, that tore the ‘Soul Train’ floor up! LAWT: What’s next for you? KN: I’m working on a new album. And I will be writing new songs, as well. LAWT: Tell me what it’s like working with Robert Townsend? LAWT: In your role as ‘Adult Tess’ on NBC’s ‘This Is Us’ you don’t dance, but as Tess Lauren, the fearless dance coordinator on ‘Soul Train,’ you really help the audience understand the value the dancers actually brought to the show. Iantha Richardson (IR): Well, thank you. What I loved about playing Tessa was her ambition. My biggest challenge in any role that you play, is wanting to give justice to the character. LAWT: Tell me about working with the director, Robert Townsend, please. IR: It was amazing, a legend as you know. He is an actors director. He took a lot of time with us, to cultivate our characters. To make sure that we are comfortable and knowledgeable. He was super hands on. The interviews with Christopher Jefferson and Jelani Winston were conducted together, at the Crosby Hotel, January 30 (2019). Christopher Jefferson (CJ): And now I am playing JT, a budding music producer. LAWT: I just saw the first two episodes and let me be frank, I am terrified of your character. Should I be? CJ: (laughing) Yes, you should be “very concerned” for JT, but you will be happy for him, I promise. LAWT: Jelani, you are just 19 and were discovered by BET in an open casting call and now you’re playing Kendall, a teenaged dad who dances on ‘Soul Train’ with your talented sister. Jelani Winston (JW): It’s been a year, and now I am playing Kendall Clarke, the son of a career military man, but someone that truly loves dancing and being on “Soul Train” is his dream along with his sister, Simone (Katlyn Nichol). LAWT: Christopher and Jelani “American Soul” is going to be broadcast globally across BET’s International linear channels in the UK, France, South Africa, and South Korea. What are your hopes about the series? JW: That people will understand the struggle of the times and what Don Cornelius had to go through to get “Soul Train” made. Kelly Price (Brianne Clarke). The interview was ­conducted at the Crosby Hotel, January 30 (2019). LAWT: I’ve been blessed to view the first two episodes of ‘American Soul.’ I can’t give away any spoilers but the second episode really touched me, deeply. Can you share a little, without giving anything away? Kelly Price (KP): Oh, wow. You saw that episode. One of the things that my coach has taught me to do, as a singer and a musician is to use my music because I always felt free in releasing my deepest pain through the music. For me, music is a safety net. I get lost in the music and I can let it go. As an actor when you take that music away, it’s silence. It’s you and it’s your words. They resonated in another kind of way because there is nothing there surrounding it. You are forced to hear every single word when you say it. And in order to not opt those moments, you have to go to those places in your life. Brianne has a lot of pain to deal with and I’ve not lost a husband, but I will say this, I lost my baby sister, weeks before my last album came out. That was more painful to me than losing my dad because we prepare as we get older to bury our parents. You never think about burying your siblings. My coach taught me how to process the pain of the memory. I was on the stage when I got word that my sister died. I can’t do the spoiler thing but that was the closest that I could relate to it. LAWT: What was it like working with the director, Robert Townsend? He and I had a very special moment. I was there one morning and I was still in the make-up chair. I kept getting these calls that the director [Robert] needs to see me. I still have on a wig cap, makeup is half done. I am in a bathrobe and some slippers. So, I run in and he’s talking to everyone, he says ‘I’m going to say a prayer and we need to give this moment respect. Think about all the families that lost someone because they went to war.’ So he talked to everyone [the extras] in that room. And then he said ‘Kelly is going to give us a song of her choice, and I’m going to pray and we are going to thank God for those that gave their lives for his country … everyone in the room is having a moment. This is the first shot of the day and Robert says this prayer and everyone is up here and he just screams: ‘Sing Kelly’ and suddenly it was like being in Church. My mother was the choir director and when they said sing, we just did it. So I just went into ‘Amazing Grace’ and by the time I finished, everyone in the room was crying. I was crying. Robert was crying. The D.P was crying. They were passing out kleenex tissue. Everybody was crying. That was day one with Robert Townsend. Premiere Dates: The (10) one-hour episodes are set to premiere with back-to-back episodes on February 5, 2019, at 9 pm ET/PT on BET. International, February 7, 2019.